Description: Like wishing upon a magical star in the sky, this decorative pendant is inspired by star lights that were originally believed to bring good luck to European homes hundreds of years ago. 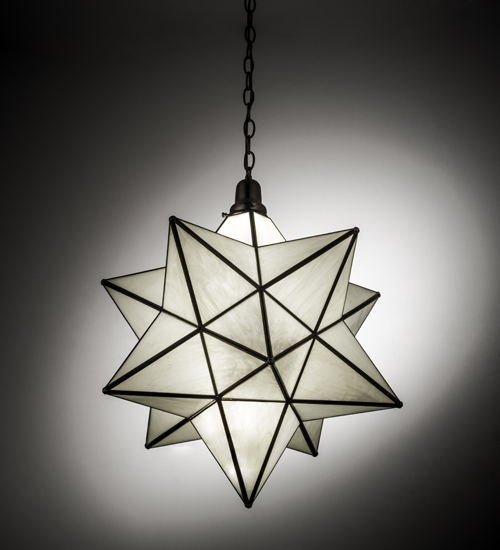 This unique fixture features a Star diffuser with a dozen points of light handcrafted with Milky White art glass. Custom crafted by Meyda artisans in the USA, this pendant is enhanced with a frame and hardware featured in a Brushed Nickel finish. This fixture illuminates with integral LEDs that deliver energy savings, minimal maintenance, quality ambient light and a long rated life. Custom sizes, styles, colors and dimmable lamping options are available. The fixture is UL and cUL listed for damp and dry locations.